Landslip in Randwick - click to see larger. At our meeting on Tuesday in The Vine Tree we discussed more about a poss quiz on 27th May at The Star, more about plans for biodiversity, welcomed two prospective members and discussed the works being undertaken by Severn Trent....as readers of this may know, since 2006 we have been trying to reduce sewage incidents in the area - back then we had repeated bursts which led to land and the brook being flooded with sewage. Over the years root cutting in sewers and other measures have improved the situation considerably. I am writing on behalf of the Ruscombe Brook Action Group, http://www.rbag.org.uk/ of which I am the Chair, to express our concern and disappointment that the positive works undertaken to re-line the main sewer on both the Ruscombe Brook and and the Randwick tributary in Stroud, Gloucestershire, appear to have caused a number of other environmental impacts. The grasslands alongside the Ruscombe Brook are of historic and biodiversity importance and we are concerned that some of the re-instatement of this land has still not been completed. Some areas have suffered from compaction and will need improvement works to restore to their previous quality. Of more significant concern to our group is the additional soil and sediment that has entered both brooks as a direct result of the works undertaken on the sewer. We understand that the sewer relining works themselves will be a great improvement and should prevent the leaking of sewage into the brooks, but we aware of two areas where soil and sediment has entered the brooks as a direct and foreseeable impact of the works. In addition, we are aware that there was a leak of sewage into the Randwick Brook which was discovered and rectified on the 31st January 2013. This leak could have caused substantial ecological damage too, and we seek your re-assurance that this will not happen again. The first of the sediment issues is the large landslip caused by your contractors in November 2012 in the More Hall Convent land. We would urge you to restore and rectify this as soon as possible as this is now a major source of soil and sediment into the Randwick Brook and therefore the Ruscombe Brook downstream of their confluence. 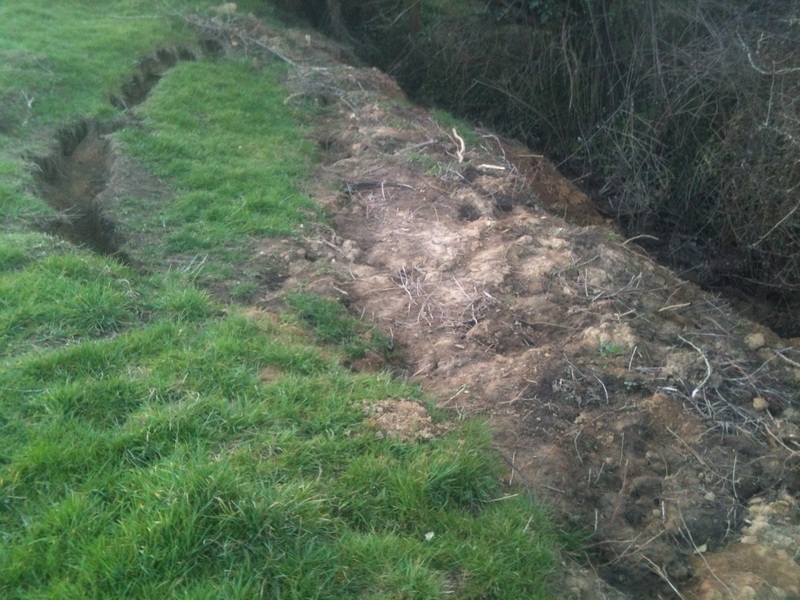 I attach a photograph of the landslip taken on the 16th April 2013 (see above). As you can see, this is a large piece of land and the quantity of soil involved will cause significant ecological damage and potentially increase flood risk for downstream residents. The second major sediment source is at the cattle drinking area of the Archway fields. The works here were completed in November 2011 and the land above the drinking area (which was churned up by your contractors vehicles) is still acting as a significant source of sediment into the Brook. The landowner has been unable to use the drinking area for long period of time as this would cause further environmental damage. Due to the lack of vegetative cover for an extended time over which we received a large amount of rain, a significant amount of soil erosion has taken place and this sediment has gathered at the entrance to the culvert immediately downstream, substantially increasing flood risk for the residents of Acre Place . We understand that this material is being removed soon, but we would advise you to restore the land above the drinking water area to prevent this accumulation of silt from occurring again. We look forward to your reply to our concerns and your company progressing these improvements as soon as possible.